The one thing that my kids look forward to on their birthday is the money cake. 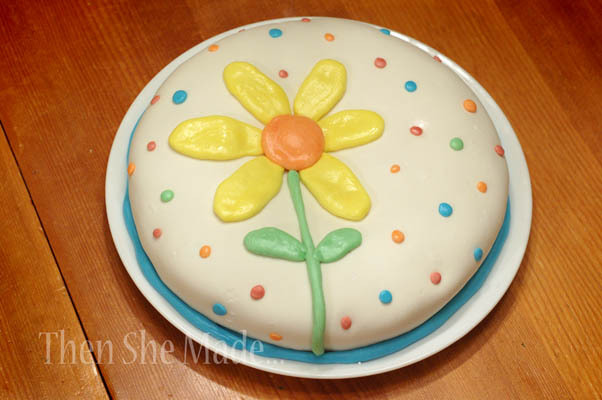 Have you heard of a money cake before? They are a long standing tradition in my family. I remember looking forward to them when I was a kid and it's something I've passed on and continue to do with my kids. Basically it's a cake that when you cut into it, you find money - Sweet! Right?! The girls like to see who gets the most money and it's just another fun way to add some excitement to their big day. 1- Gather coins and WASH them really, really well. I will usually let my coin soak in really hot water and then wash them twice with dish soap. You could boil them if you felt like you wanted that extra cleanliness however the coins them self never actually touch the batter so I don't do that. 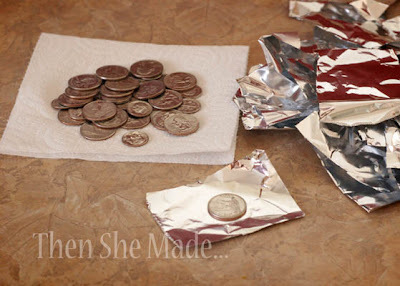 2- Wrap each coin in tin foil. Make sure you seal it up really well. 3- Drop the coins into the batter and bake. It's really pretty simple. The coins will settle towards the bottom of the pan so it's fun to make these into a two layer cake. That way, when they are stacked, and you cut into it, it will show the coins on both layers making it even more fun for the kids. This year I just made the girls small cakes, I have twins, and since they actually aren't big cake eaters I didn't go all out with making layered cakes for each of them. The fun was still there though, and they loved finding the money hidden in each piece. If only I had remembered to take a picture of it when it was cut... maybe next year. I was also thinking this would be fun to turn into a St. Patrick's Day tradition too. I'm not sure if you can buy gold foil, but if you can you could totally make a green cake with gold coins hidden inside.... oh yeah! That would be awesome. I think I just may have to do that. This is such a cute idea. I really love your blog! Great work! We used to do this when I was a kid, and we loved it as well. I'd never heard of anyone else doing it, so it was really fun to read here. I think I'm going to have to re-start this tradition with my children :) p.s. I love your blog too! This is a great idea! I think I would put individual coins in cupcakes too, and maybe top off with one of those gold wrapped chocolate coins you get at Xmas. 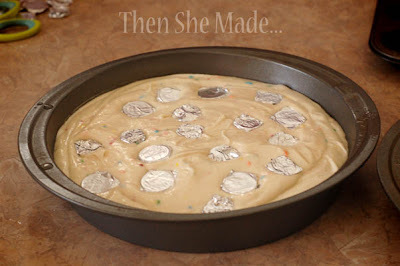 I really like this idea, would you be able to post a link to the cake batter recipe you used? Cheers and thank you for the cute pictures! @Babs - I just used a box cake mix. Do you remember which one? 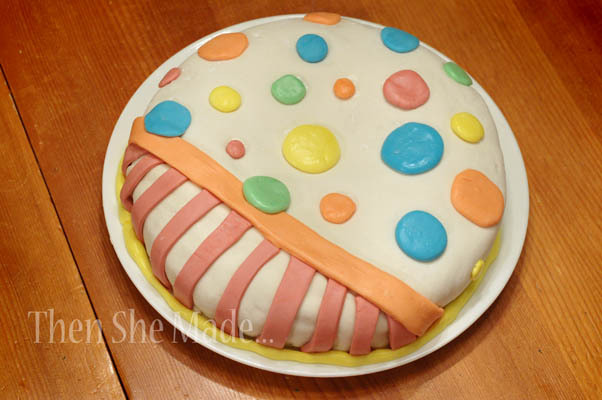 I really like the little coloured candy dots inside! yes, it's called "Funfetti" and it's by Pillsbury. It's in a blue box. It's a good mix and has a good flavor.